In the last few years, a series of photos circulating over the Internet via email and online, usually with the title of “Man Who Befriended a Great White Shark”, showing close encounters between a man and a great white shark. The sites who publish these photos (and sometimes PowerPoint presentations) claim that an Australian fisherman named Arnold Pointer once freed a great white shark from a fishing net, and the shark has followed him around ever since. Yes, sometimes -very rarely- that kind of unique friendship between a man and a wild animal do occur. But not this time. The photos attached to the story are real, but the story itself is a hoax. It’s actually an April Fools joke from the French magazine “Le Magazine des Voyages de Pêche” (English: Fishing Travel Magazine), from the issue of April 2006. The pictures are in fact authentic but collected from different and unrelated sources. The magazine put them together to create a fake story: the fisherman accidentally caught a large female white shark in one of his fishing nets and instead of killing her, he set her free and named her Cindy. From that day forward, the shark followed Arnold every time he set out to sea. The photo has circulated widely on the Internet along with speculation that it was Photoshopped or faked. Then things started to go crazy. The original photo was photoshopped many times to create fake stories. For example, after Hurricane Irene battered the Caribbean island of Puerto Rico in late August 2011 and flooded many streets on, the shark from the original photo used in a fake image showing a great white swimming beside cars. That fake image then started being circulated on the internet and media: according to Huffington Post, it appeared on EgoTV with the caption: “This picture was taken in Puerto Rico shortly after Hurricane Irene ravaged the island.” Even funnier, the authorities in NYC were warning people not to go swimming in flood waters after a hurricane. Once, it was used in a TV bulletin on Channel 7 News Miami. It was resurfaced again in June of 2012 when a shark tank supposedly burst in a popular mall in Kuwait. After the Hurricane Sandy, the deadliest and most destructive hurricane of the 2012 Atlantic hurricane season, and the second-costliest hurricane in the United States history, the very same shark made the same appearance outside a car window in the flooded streets of New Jersey. 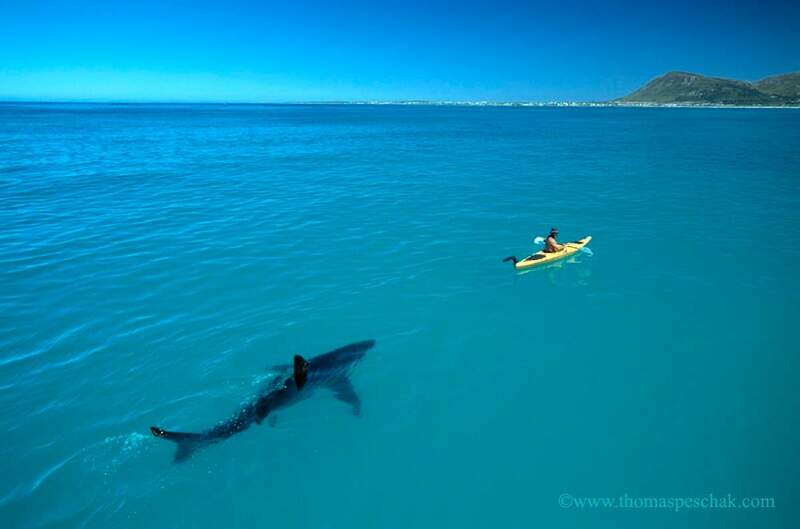 The original photo, “great white shark following a kayak” was photoshopped many times to create fake stories, like this one – Shark swimming in a flooded street. “It is hard to get rid of an almost 17 feet long shark since the White Sharks are protected by the wildlife conservation, but a mutual affection established between Arnold and ‘Cindy'”. In the video above, after the famous “shark following a kayak” photo, the man who touches a great white shark is Michael Scholl, founder of the White Shark Trust in South Africa, “a non-profit organisation founded in 2002 to promote and conduct research, education and conservation projects on the endangered Great White Shark”. They offer opportunities for field research for those interested in great white sharks including first-hand encounters with sharks that are lured to the research boats. Some of the sharks are known to curiously hang around and allow themselves to be touched. Funny thing is, even in the video you can see a watermark saying “Michael Scholl copyright”. But, before that, the video says it was a “Incredible Shark/Human love story” between an Aussie fisherman “Arnold Pointer” and a great white shark that he freed from fishing nets. Somehow, Arnold Pointer becomes Michael Scholl but it seems most of the people watching this video didn’t notice that. The comments section of the video contains tragicomedy. Man touching a great white shark. This photo is a frame from the BBC television series Planet Earth. The final picture of the leaping shark is a frame from the BBC television series Planet Earth. Here is a real story of a man who befriended with a shark – Not a great shark, though.